Surprised after reading the strange title? Yes this is absolutely true. This Diwali, TECHNOY MOTORS, a premier authorized showroom for Maruti Suzuki cars in Udaipur, is bringing its showroom at your favourite place: THE CELEBRATION MALL. 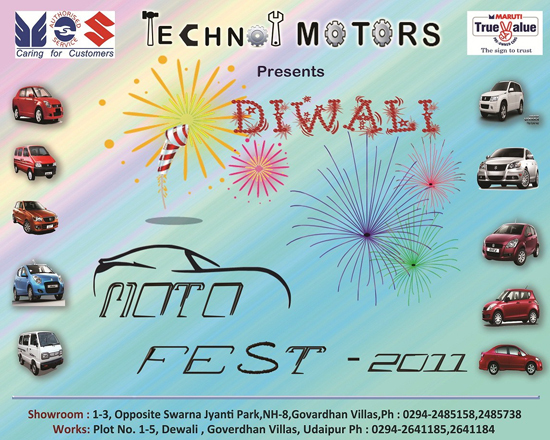 THE DIWALI MOTO FEST 2011, as they call it, is going to be an awesome plan for the spending this weekend. This Sunday, 16th of October at Celebration Mall, right from 10 o’clock in the morning till the complete evening, there will be latest cars by Maruti Suzuki on display, Maruti Special Diwali offers, lots of fun, games, and other stuffs which you can enjoy with your family, and win prizes, which will be hosted by famous Anchor. You can get a test drive of their favourite Maruti vehicle, and can enquire about the prices, hot deals, and exclusive offers on each Maruti Car, alongwith Maruti Special Diwali Scratch and Win Offers. You can also get an evaluation done for your old cars, if you are planning to take a benefit of the Exchange offer. Not only this, on-the-spot bookings on the day will be rewarded with special PVR Gift Cards. So what are you waiting for Udaipies? This weekend, come for happiness at Celebration Mall, and also bring home a Maruti Suzuki on the occasion of Diwali, with loads of happiness and gift items.